Canon's PowerShot range can be confusing. Unlike the Ixus range, which is a fairly tight grouping of mid-range compacts, a PowerShot can be anything from the A490 (now down to just £80 and no worse for it) to the breath-taking DSLR-threatening Canon G11, which costs nearly £400. 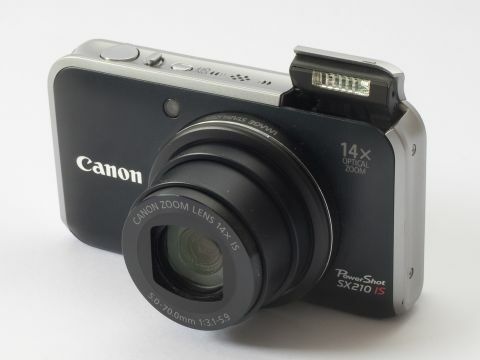 This breadth of price and quality is what makes the range so interesting, and there's no doubt as to which end of the spectrum the Canon PowerShot SX210 IS lies. Even without the tempting specifications on view, the price gives it away - at £340 this is towards the top of the compact camera pecking order. Indeed - you could buy the Sony A200 for this much and have money left over for a new memory card. Such a high price for a compact means the camera in question needs to be excellent in all regards, and there's no argument from us that Canon is trying to position the SX210 IS as a go-anywhere, do-anything compact for serious enthusiasts. The key specs give it away - the 14.1MP sensor and 14x optical zoom mean you should be able to take just about any picture with this camera, with room left over to reframe shots without moving your feet, and with enough latitude in terms of resolution to crop mercilessly on areas of detail. But how does it hold up in use?